Starring Malaysian hotties Henley Hii and Josh Lai, this local production (I know...ironic since the cast is mainly Malaysian) is set in 1983 during National Service. A timid recruit (Tedd Chan) believes that a local female ghost is out to get him and when he dies during a night march, his best friend and platoon mate soon experiences weird hauntings, where another platoon mate is even possessed. I must say that this is one of the better Singaporean productions and it was a lot more horrifying than 'Changi Hospital' but less thrilling than 'The Maid'. Thumbs up for local productions! The film quality was very good and I liked how the director, Gilbert Chan, weaved in jabs at what's currently going on in today's National Service (think of spoilt boys with their mobile phones and a really funny liner regarding maids carrying the pack). The plot was a little predictable, it reminded me of 'Ghost Whisperer' meets 'The Ring' where the ghost was haunting and killing for a good reason and not because she's the spawn of the devil. Some parts were not very believable either. 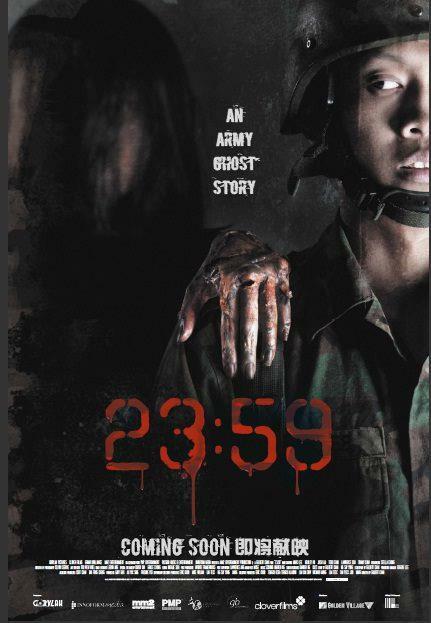 I reckon that the horror could have been amplified if there wasn't so much humour in the script especially with Mark Lee's Sergeant Kuah and your typical hokkein-spouting bad-boy soldier played by Lawrence Koh. Might've been better if the movie opened during the lunar 7th month or on Halloween itself to increase the spook factor. All in all, I was quite entertained and I wouldn't mind watching it again on telly just for the heck of it. You won't be scared till you pee in your pants but at least you don't leave the cinema feeling like you've wasted your money on a ticket.